… is amazing. I drink it almost every night (with a bath… lukewarm instead of my usual scalding hot because of the baby 🙂 A little honey is all it needs. Love the taste of blueberries and honey! 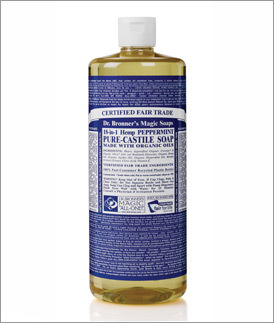 … Dr. Bronner’s Peppermint Soap. I use it for body wash, hand soap, washing the dogs, washing my face, yeah just about everything. Put a little on a loofah for a good scrub and your skin will feel so tingly and alive! Oh yeah, and it’s organic… win!